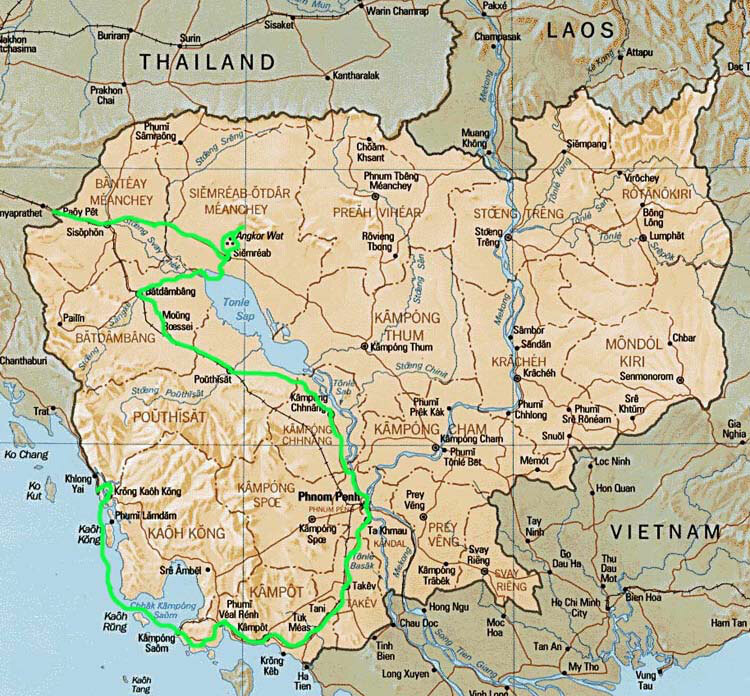 978 km of cycling - as part of a bicycle world trip - from the Thai border to Siem Reap with the temples of Angkor, by boat over rivers and Lake Tonle Sap to Battambang and further southeast to the capital Phnom Penh, to the coast and to Sihanoukville and by boat back to Thailand. Do you like Cycling Cambodia? A few days after Steffi and I escaped the stinking traffic of Bangkok after several kilometers, we cycled to Cambodia in early December. If we had not been able to push our wheels past the endless queue of waiting crowds, we probably would not have crossed the border until today. And so it went through an incredible crowd of people, carts and other companions within a few hours across the border to Poipet. For the first time on this tour it was called "legal traffic" from today! The wing mirror was changed quickly, but the Cambodian traffic took some getting used to. The steering wheel usually on the right side, license plates almost unknown, the battered vehicle was beaten under continuous horns even over the deepest potholes. On the following 170 km bad pothole and dust track that meant for us, under a constant horn concert masked up to the eyes at a snail's pace around the potholes, with each passing vehicle in a cloud of dust wrapped to go east. But the next day it was over and, fortunately, it should have been the worst road on our Cambodia round. If you pass by the Cambodian huts, much poorer than their neighbors, but despite decades of civil war, and unbelievably friendly and open, you'll be thrilled to arrive in Siem Reap, the gateway to the world famous temples of Angkor. Huge luxurious hotel and resort facilities and western standard shops (and prices!) Are like another world! The incoming tourist probably sees little of the actual Cambodia. I was grateful, however, to the French, who had introduced baguettes during their occupation. Finally something different than toast bread! After purchasing the 3-day ticket for $ 40 per person, we spent three absolutely impressive and beautiful days exploring the temples of Angkor, capital of Cambodia's former Khmer empire. So we cycled considerable distances between Angkor Thom, Bayon, Phnom Bakheng, Pre Rup, Ta Keo, Ta Prohm and many more, not least Angkor Wat, the breathtaking, monumental, largest religious building on earth! We experienced sunrise and sunset at different temples, but that meant going back 15km from the city to the temples every day in the dark and in the dark. On good and flat road we passed endless rice fields and just endless friendly "Hello" and "Bye bye" calls of the nice Cambodians. In Pursat we were again invited by a teacher spontaneously to his school and his house. With his salary of 30 USD per month and the corresponding home made of boards and two rooms, we did not want to take the few places for the big family and so after a city tour of three on the teacher's moped we moved into an inn. Arrived in Phnom Penh on the banks of the Mekong and again fit and healthy, we treated ourselves for 5 USD per night a brand new renovated room with bathtub, hot water, satellite TV with German channels (!) And free coffee and tea. We spent three days sightseeing the beautiful variety, such as temples and the Royal Palace, and the shocking variety, such as the terrible legacy of the Khmer Rouge regime. Like the Nazis, the civilian population had been tortured, kidnapped and murdered in tens of thousands for decades. In the Tuol Sleng Prison Museum and the Killing Fields of Choeung Ek, this darkest side of the human being was stiflingly demonstrated. Two days after leaving the capital we met on the way to Kampot on the south coast of Cambodia and near the border with Vietnam on Terry from the USA, also by bike. 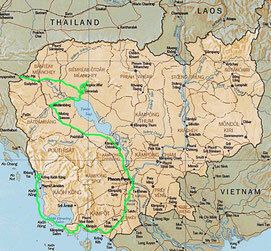 Together we cycled for three days along the coast and fought in the sunshine against squalls west to Sihanoukville. Two days we stayed in a free accommodation right on the beach. The only condition was, now and then in the associated beach cafe something to eat and drink. So we had breakfast baguette, chocolate cream, omelette and coffee always directly on the beach on the sand with sea view! Even the average backpacker does not see much of the actual Cambodia apart from the three tourist "enclaves" Siem Reap, Phnom Penh and Sihanoukville. So here in Sihanoukville despite nice beaches did not keep me much and we made our way by boat to Koh Kong in the very south on the border to Thailand. I had seen true Cambodia outside these three "enclaves" and got to know its incredibly friendly and always smiling people! For Terry it was said that we had to drive further north to the temples of Angkor, so we were only two when we crossed the Thai border at Hat Lek.